The Discount Card fundraiser lets you customize your own discount card. You dream it and we'll create it! 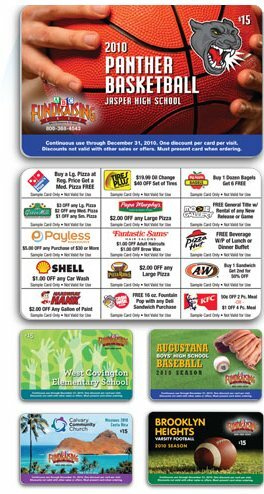 The discount card fundraiser allows you to start a traditional yearly fundraiser that you customers will be anxiously waiting for. Win-win situation, your donors will enjoy savings through out the year! The Discount Cards will be personalized in high definition graphics with your group's logo on the front in full color. Don't have a logo? No problem, we'll create one for you at no charge. Minimum order is 300 cards, which are full color both sides and merchant logs in full color too. Top notch professional card that your group will be proud of. Cards are even more durable than a credit card. Our team of merchants specialists then call the your merchants and create your custom discount card with 15 great offers. Receive your cards within 3-5 weeks of faxing your wish list..
Why are we different? Our Discount card is colorful in high detail, very attractive produced at the highest level of quality on our own printing equipment. We also offer bonus free Scratch & Help cards that will add to your profit! 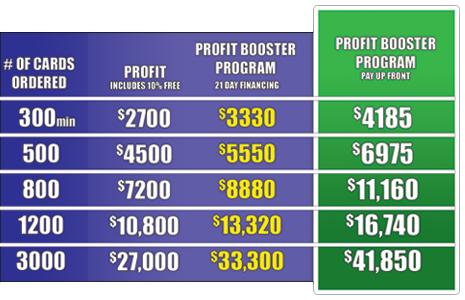 We guarantee the highest profit.